Barrel samples for bench trials. There are a couple times a year when we get to really geek out on our wine. Obviously harvest lets us get down and dirty with our vines and crushing the grapes, but this time of year we get familiar and obsess over our reds from the previous vintage. Last week we pulled our 2008 samples from the barrels to determine our line up of reds from that vintage. We had learned a great deal from pouring these wines at last month’s Barrel Tasting Friday and the input we received reinforced our feelings that the vintage deserved a Meritage blend as well as a Reserve Cabernet Franc. Out of Merlot, Cabernet Sauvignon and Cabernet Franc, the CF is showing the best at the moment and will be racked out of barrels as soon as possible. Racking is when you basically siphon the wine out of the barrel into a stainless tank. We’ve picked the barrels that will go into each blend and for example in our Reserve CF, we will rack three barrels into a tank and let them marry together for up to a month before we bottle. It looks like our Meritage will be a blend of all three grapes with the CF making up the majority of the wine. We will also bottle a single label Merlot and Cabernet Sauvignon from this vintage as well. Overall we are surprised at how good these reds look considering 2008 wasn’t the warmest growing season, but once again we owe it to our Vineyard Manager Chip Manning for giving us healthy grapes. We have such a good time coming up with the blending ratios that we are going to have a Barrel tasting Friday Event next month where you’ll be able to blend your own wine from the three varieties and take home your creation. Make sure you are on our mailing list by emailing wines@freedomrunwinery.com or by finding us on Facebook to get word of when we schedule this blending party! Happy Labor Day! We're all relaxing this holiday after a busy few months of bottling the reds, pouring at summer events, tending to ten acres of vines, celebrating our grand opening and everything else that keeps a young winery busy. But with all the hard work that went into our first release of wines, we thought we'd take some time to appreciate the recognition they have already received. At the most recent New York Food and Wine Classic Governor's Cup Competition. our 2005 Merlot was awarded a silver medal, and two bronze medals were awarded to our 2005 Manning Manor Rose and our 2005 Chardonnay. 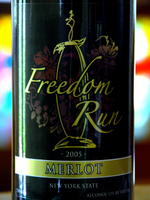 The 2005 Merlot is made from grapes grown at Ackerly Pond Vineyards in Peconic, NY. Our winemaker did a spectacular job here with a ripe vintage. The competition was held in Napa, California a few weeks ago and the panel was made up of a majority of California judges. The Governor's Cup is an annual wine event that judges only NYS wines, and given the amount of quality wine being produced in NY today, the competition is stiff. It was a second bronze medal for the Chardonnay, which won the bronze at the Finger Lakes International Wine Competition where our 2005 Semi-Dry Riesling and 2005 Catawba won silver, and our 2005 Manning Manor Reserve won bronze. Our recent success only makes the future brighter as our recently bottled 2005 Cabernet Sauvignon is drinking extremely well lately. With a fruit forward nose of black currants and sun dried tomato, this one has been turning heads in our tasting room. As we mentioned weeks earlier, our 2005 Cabernet Franc is our red baby right now, with only six weeks since bottling. It's peppery finish along with the flavors of black cherries and leather have been widening eyes lately. It's perfectly rustic right now, with each week in the bottle smoothing out the tannins and bringing the fruit forward. Being such a young winery, we are thrilled to have received such a positive response in only our first year. With fall on the way, the thought of sitting back with our red wines on a cool night sounds enticing as ever. Luckily for the white wine drinkers out there, Lake Ontario and the Niagara Escarpment provide some extended warmth for our area and a few hot days are sure to pop up. So keep that Chardonnay or Catawba on ice. Cheers!